Most lead-acid forklift batteries provide around 2,000 charge cycles, which usually translates into about five years of service life. But even this lifespan can only be reached with proper maintenance. Establish regular maintenance intervals for all industrial batteries to realize the full value of your investment. With the right care, many batteries can last well beyond the length of their warranties, powering forklifts for years past the typical battery lifespan. There are three essential maintenance tasks that provide reliable service for forklift batteries: watering the cells, washing the battery case, and conducting regular equalization charges. A detailed explanation of each task follows, along with tips to perform each job safely. Figure 1. The Water Deionizing System (WDS-1) purifies water straight from the tap to maximize battery performance and also includes a purity light which monitors the system’s status. Battery electrolyte is a mixture of sulfuric acid and water. When water levels get low, the battery’s plates can be exposed to open air. This causes oxidization, which permanently reduces capacity and shortens overall battery life. In addition to water losses from simple evaporation, the charging process breaks water down into its composite molecules. As hydrogen and oxygen float out of battery vents, the water level within the cells will deplete. Excessive water loss might be a sign that the battery is gassing more than it should. If you notice a battery losing more water than usual during a charge, have a technician inspect the battery and the charger. Only water forklift batteries after the charge, not before. Electrolyte expands during the charging process, and adding water before the charge risks over-watering, the leading cause of boil-overs. Use clean, non-ionized water. Many municipalities have additives or minerals in tap water. These pollutants collect on cells as water evaporates, leaving layers of residue that reduce battery capacity. If you live in an area with hard water, use a Water Deionizing System to purify water before adding it to cells. Fill battery cells to about 1/4-inch above the element protector. For best results, install an Integrated Watering System. This system mounts on a charger cabinet, with hoses leading out to battery cells. It can be set to automatically water multiple batteries, activating just after a charge cycle completes. Battery manufacturers recommend watering forklift batteries once a week. Older batteries may require more frequent watering, and should be checked more frequently. However, a consistent need for watering may be a sign that something is wrong with your battery or charger. Conduct a thorough inspection of the battery and its charging equipment if a single unit consistently shows low water levels. Over time, different cells within forklifts may develop slightly different power capacities. When this happens, users can’t charge batteries to full power; one cell may be fully charged while another only holds a half-charge. Equalization charges prevent this inefficiency. Essentially, the equalization charge is a purposeful overcharge. The typical charge cycle lasts about eight hours, while an equalization charge tacks on an additional three hours or so. Chargers continue to provide a low stream of power for those final hours. This practice also prevents stratification, a potentially damaging condition in which acid and water separate within cells. During the final stages of equalization charging, forklift batteries release hydrogen and oxygen. These escaping gasses form bubbles, which provide a stirring action to electrolyte, thus preventing stratification. Note that equalization charges require longer cool-down times than the typical charge cycle. Because most battery manufacturers recommend a weekly equalization charge, many operations perform this task over the weekend, allowing adequate time for both charging and cooling before the next shift. As batteries release gas during charges, a fine acidic vapor may drift to the tops of battery cases. Agitated electrolyte can spill out of battery vents during the charging process, an occurrence typically known as “boil-over.” Over-watering cells increases the risk of boil-over. Batteries may leak electrolyte. If they are stored in tiered racks, and drip-pans are not installed or changed regularly, the batteries on the upper levels might drip electrolyte onto those below. The acidic residue built up on forklift battery cases can cause all sorts of problems. First off, it may create a conductive circuit between lead posts and the steel case. This causes a low-level but constant self-discharge, burning through charge cycles and limiting the lifespan of the battery. Secondly, acid accumulation can corrode terminals. Damaged terminals may cause electrical problems in lift trucks, as well as limiting battery capacity. They might even render a battery unfit for use. Regularly spot-clean the tops of battery cases with an acid-neutralizing de-greaser such as AcidSafe Liquid. Just make sure the vent caps are tightly connected before any washing task. Accidentally introducing neutralizers into electrolyte will ruin your battery. In addition to cleaning the top of the battery on a regular basis, or following boil-over or spills, thoroughly wash forklift batteries two to four times per year, depending on usage. A battery dealer with a Battery Wash Cabinet Kit can simply provide this service on-site, with minimal downtime for forklift batteries. Technicians arrive with a portable Battery Wash Cabinet, complete with fork pockets for easy delivery. Two 330-gallon tanks allow them to haul in fresh water, capture all runoff from the wash, and carry away used water for recycling and/or disposal, in accordance with federal and local environmental regulations. Figure 2. 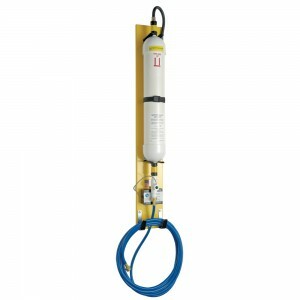 Handling industrial forklift truck batteries can be a hazardous task. 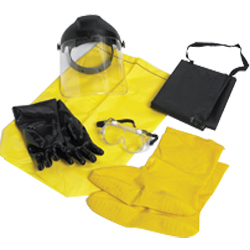 It is important that management offer personal protective wear and personnel take precaution by utilizing the personal protective wear. Forklift battery maintenance often places employees in close proximity with acidic electrolyte, which can cause serious chemical burns or even blindness. Battery rooms are smoke-free areas, and should have signs reflecting this. Other battery room signage should label electrical hazards, eye wash stations, spill kits, and lift truck traffic areas. Never wear metallic jewelry when working with forklift batteries. Avoid contact with terminals or battery cells to prevent electrical burns. Don’t use metal tools near batteries. Only non-sparking tools are safe for battery maintenance. Choose spark-resistant equipment to minimize explosion hazards. Only store batteries in areas that have mechanical ventilation and hydrogen gas detectors. batteries weekly with a Water Gun (WGX), clean tops of battery cases monthly with AcidSafe Liquid (ASL), and wash batteries every few months with a Battery Wash Cabinet (BWC). Water cells if necessary (after charging). Check for residue on battery cases; clean with AcidSafe if necessary. After charging, measure specific gravity with a hydrometer. Standard forklift batteries, fully charged, should usually have an ideal specific gravity of 1.285 (check with manufacturers to make sure). If specific gravity differs from one cell to another, try an equalization charge. Provide an equalization charge with ample cool-down time. Give batteries a detailed inspection. Look for signs of corrosion on terminals. Check connectors and cables for damage. Clean tops of battery cases with AcidSafe or similar neutralizing agent. Wash batteries thoroughly. 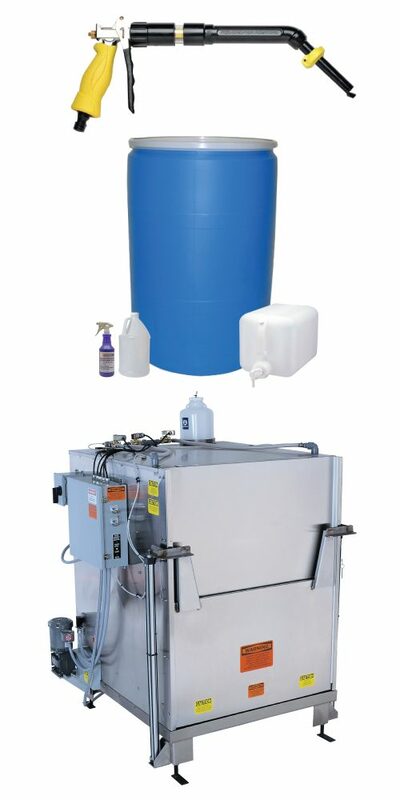 Battery Wash Cabinets automate the process, including optional neutralizing agents and air-drying on completion of the wash. Send spent batteries to recycling services. Forklift battery dealers may offer service packages that provide all of these maintenance services; ask your provider. Alternately, battery room operators can provide in-house maintenance to extend the life of the whole battery collection. No matter who provides the service, though, maintaining batteries is a crucial part of running a profitable electric forklift fleet. Faust, Brian. “Proper Care, Safety and Maintenance of Forklift Batteries.” MHLNews. Penton, 21 Nov. 2014. Web. 13 Dec. 2016. “Forklift Battery Care Instructions.” FleetmanConsulting. Fleetman Consulting, n.d. Web. 13 Dec. 2016. “Powered Industrial Trucks (Forklift).” OSHA. Occupational Safety & Health Administration, United States Department of Labor, n.d. Web. 13 Dec. 2016. Redel, Kevin. “Charging, Watering and Cleaning a Forklift Battery.” ForkliftAmerica. Forklift America, 6 March 2016. Web. 13 Dec. 2016. Schiavo, Brian. “It Keeps Going And Going…” FoodLogistics. AC Business Media, 16 Dec. 2008. Web. 13 Dec. 2016.